As weekends go, this one was pretty fantastic! 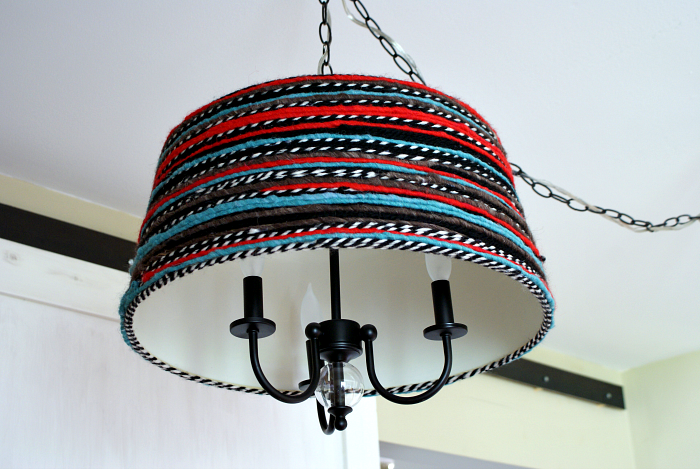 Jesse and I celebrated our five year anniversary, I finished DIY-ing this fun light fixture for over the dining table and we found the estate sale Holy Grail, on Saturday morning! That deserves a whole separate blog post! Now, more about working on the dining space. I've been checking the Habitat Re-Store once a week for about a month hoping to find a light fixture for over the dining table. I got lucky on Wednesday when I stopped in over lunch and found this little number. Also, side note, I think this purchase, which followed this one and this one, officially puts me in a "lighting" phase! There was absolutely nothing wrong with the light, it's a current style and quite nice looking. I'd say it was a bargain at twenty five bucks. 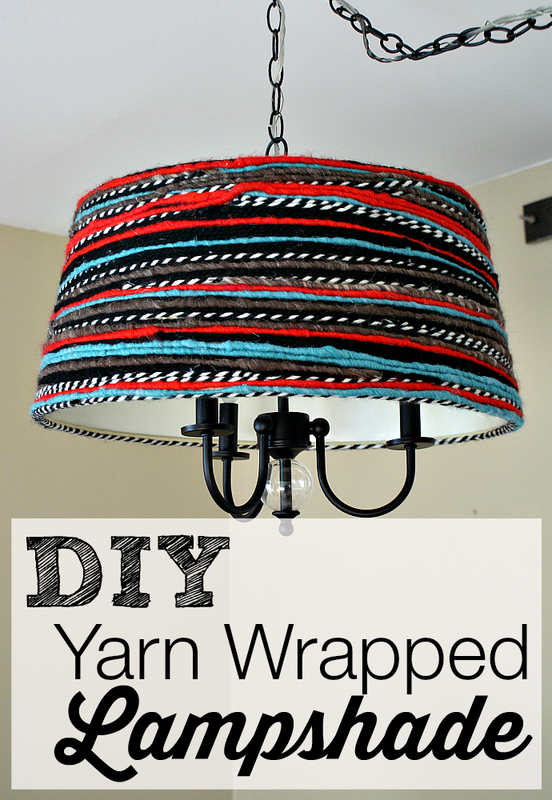 But of course I needed snazz it up a little, so I used about ten sticks of hot glue to wrap the shade in yarn! I'm not sure why, but it's pretty much impossible to get a clear picture of those stripes using my camera. I suspect I need a better lens. I also need to learn how to use my camera properly. It's on the list! After Jesse showed me how to install a light fixture, I really wanted to try this one while he talked me through it. Unfortunately, when I removed the old light, the wires coming from the ceiling were a mess and required replacing. We'll also need to do something about that drywall damage around the hole. As I understand it, the repair is simple. The sticky part is deciding whether to paint the entire ceiling so it matches or use a medallion to cover the mis-matched area. I need a little time to think about it, plus Jesse has a paid side project he's working on right now, so this will have to take a backseat for a week or so. It took me a while to decide on a rug, but I finally landed on this one from Momeni. I'm glad I took my time deciding, I think it's perfect! Overall, the dining space is looking really sharp! It gives me warm fuzzies when I compare it to this before picture! The only items left on my list are some kind of low and long centerpiece. Succulents would look great, but that corner doesn't get enough light for anything to grow. I'd also like one or two pieces of art for the wall; a modern abstract or maybe a charcoal sketch would be good. I'm keeping an eye on the One Kings Lane vintage art sales for something I love within my price range. Lastly, I need to give a shout out to these amazing flowers that Jesse sent to my office for our five year anniversary. They are the same mix of flowers used in our wedding. So thoughtful! Love a good yarn bomb Rachel, this is adorable! Restore is one of my favorite haunts too. Thanks, Brenda! I'd never heard the term "Yarn Bomb" until last night! HAHA, I love it! Hmmm, what else can I bomb....? Love the yarn. So fun!